The city and county of San Francisco (“The City” as it is known to its residents) has long struggled to meet the housing needs of its citizens based on its geographic landscape and local political frameworks. Whether it be the mid-19th century fires, the great 1906 earthquake and fire, the 1950s urban renewal changes and displacement, the 1970s emergence of the Castro, or the 1990s dot-com boom, San Francisco’s geographic and cultural landscapes have continually shifted, much like the tectonic plates upon which it resides. In other words, gentrification in San Francisco’s neighborhoods is, in historical and biographical perspective, an ongoing process. Efforts to expand the City’s housing stock are simultaneously and severely limited by the geography of the area. With the Pacific Ocean to the west and the San Francisco Bay to north and east, the San Francisco Peninsula’s total area spans 223 square miles, yet its central city is locked into less than 47 square miles. While landfill expansion into the Bay was stopped in the early 60s by organizations such as Save the Bay, much of San Francisco’s northern and eastern boundaries have already been extended past its original, natural boundaries. This extreme geographic limitation, combined with other factors, has led to San Francisco’s rise as the nation’s highest square foot cost for private residences. At its Winter 2014 meeting, ASA Council approved a member-generated proposal to establish a program focused on the needs and interests of sociologists at or near the retirement stage of their careers. 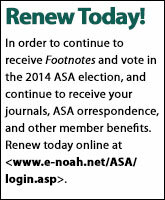 The creation of the ASA Opportunities in Retirement Network (ASAORN) provides a national-level outlet for an initiative that began at the Eastern Sociological Society meetings in 2009. “Opportunities in Retirement” sessions have also been held at the Pacific Sociological Society, the Midwest Sociological Society, and, most recently, at the Southern Sociological Society meetings. An exploratory meeting for ASAORN was held at the 2013 ASA Annual Meeting, with nearly 40 ASA members attending, in addition to ASA staff Karen Gray Edwards and Margaret Weigers Vitullo. 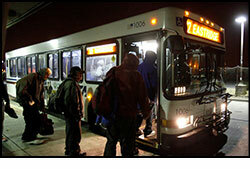 Homeless individuals seek shelter on a Santa Clara bus. Sociology undergraduate majors who possess a strong foundation in sociological theory and methods can greatly benefit from an opportunity to apply their skills to address community issues and needs. In this short piece we provide examples of two community-based projects related to homelessness, which involved undergraduate students in Applied Sociology classes. One took place at the University of Tampa, a small private university in Florida with an accredited program in Applied and Clinical Sociology; the other at Santa Clara University, a small private university in California where Applied Sociology is a required capstone for all sociology majors. 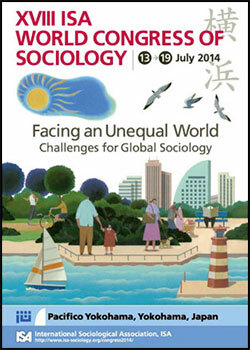 This July, the International Sociological Association (ISA) World Congress of Sociology will take place in Yokohama, Japan. This will be the first time ISA has ever met in East Asia or Japan. Sociologists in Japan have long dreamed of having such a world meeting held in the country. As Chair of the Japanese Local Organizing Committee (LOC), I would like to introduce the history of Japanese Sociology, past and current research trends, and challenges sociologists face in the country.